This website provides access to Certificates of Compliance (COC) for all MAM products as required by Section 102 of the Consumer Product Safety Improvement Act of 2008 (Sec. 102 CPSIA). To access a COC, please enter the COC - Code in the field below. You will find the COC - Code printed on the outer-carton. Please type the COC - Code exactly like it is printed on the carton (e.g. : 1334-000). If you are a consumer and want to access the COC of a product you purchased, please ask your retailer for the COC - Code. » How to find the valid COC which was referenced to by a product-set COC? To view our COCs you will need Adobe Acrobat Reader installed. You can download Acrobat Reader for free from http://get.adobe.com/reader/. To learn more about MAM and our products, please visit our website mambaby.com! On this website we are further providing the tracking information for all our products as required by Section 103 of the Consumer Product Safety Improvement Act of 2008 (Sec. 103 CPSIA). 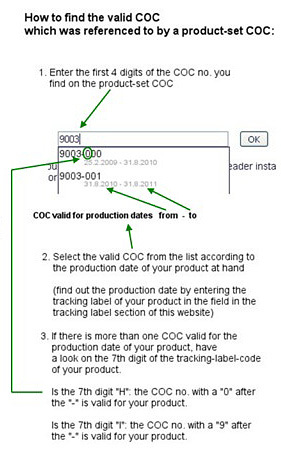 Please enter the tracking label codes without spaces in between the characters.